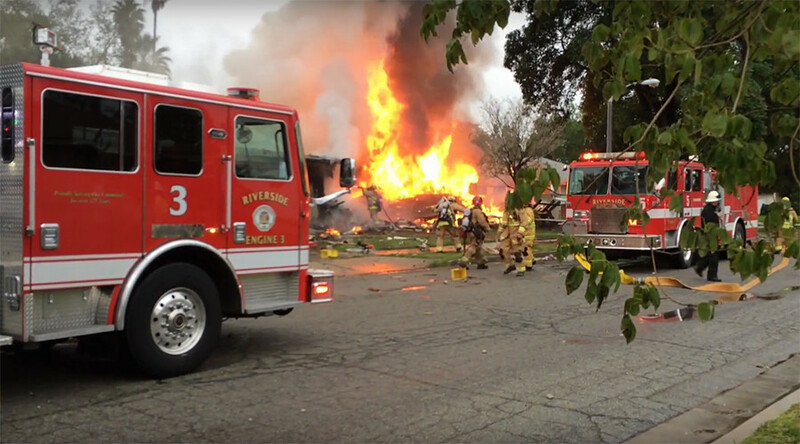 At least 4 people have been killed and 2 injured after a Cessna 310 aircraft crashed in a neighborhood east of the Riverside Municipal Airport, setting several houses on fire. The aircraft crashed shortly after taking off from Riverside Municipal Airport, the Federal Aviation Administration said. The six-seat, low-wing, twin-engined monoplane was en route to San Jose, California when it crashed in a residential neighborhood, FAA spokesman Ian Gregor said. “We have recovered four victims that are deceased,” Fire Chief Michael Moore told reporters, stating that at least one body was a “teenage” person. According to the chief, some 60 firefighters are still searching for at least two other missing people whose houses were destroyed in the plane crash. A further two people who suffered injuries are being treated in hospital. According to one survivor, five people were on board the plane coming back from a “cheer conference” at Disney Land. Images from the scene showed extensive fire which erupted after the plane crashed into a suburban neighborhood of Riverside at the intersection of Central and Streeter Avenues. Riverside Police Lt. Charles Payne confirmed that two homes have been affected. Residents of nearby homes were evacuated from the area and taken to a local community center, Payne said. Authorities have cordoned off the area, while firefighters continue to battle the flames. More than a dozen emergency vehicles are at the scene, including paramedic vehicles and police cars.